It might seem like an unusual holiday destination but after spending just a couple of days with 6 of our 7 children in Portsmouth in Hampshire on the South Coast of England we wished we had booked to stay longer because there is so much for families to do. We wanted to see the flat - parents with older offspring will understand how much better you feel when you can picture exactly where your grown-up child is living. So after weeks of scouring the internet for cheap hotel/B&B/deals we finally found our cheapest option was a last minute Premier Inn just a few miles away from where DS#1 now lives. We decided to make time for a picnic before his appointment and found a great park called The Rye in High Wycombe. Grass, playground, a lido, a stream, toilets and a cafe - perfect! Back on the (slow) road to Portsmouth an after consulting the weather forecast app on my phone we decided it would be wise to at least have a visit to the beach even though it was already 6pm as heavy rain was forecast for the next day. Typical! We parked by the Hovercraft terminal (read about our trip on the Hovercraft last year here) and enjoyed our usual pastime of throwing stones into the sea for a while then after watching the hovercraft come into the terminal from the Isle of Wight we headed back to the car. We weren't quite quick enough to get back to the car though as when the hovercraft turned round to return to the IOW we all got drenched from the seaspray whipped up by the giant fans! Now we do like a bargain and my husband had received an email offering a kids eat for £1 deal during half term offer at Fayre and Square pubs. No this isn't a sponsored post, I'm just so impressed with the chain that I'm sharing info. They are by no means gourmet pubs but if you want pub grub like scampi, steak, burgers and curry and a good range of children's choices at a great price check them out. The pub we went to, The Thatched House, was a hidden gem - a fabulous view of Southsea Marina, a little bit of weed-strewn beach for beach combing and a little tiny Wacky Warehouse soft play area which kept my younger ones happy until their food arrived. Staff were friendly and helpful and the bill for 4 children's meals and three adults meals and drinks? £36! 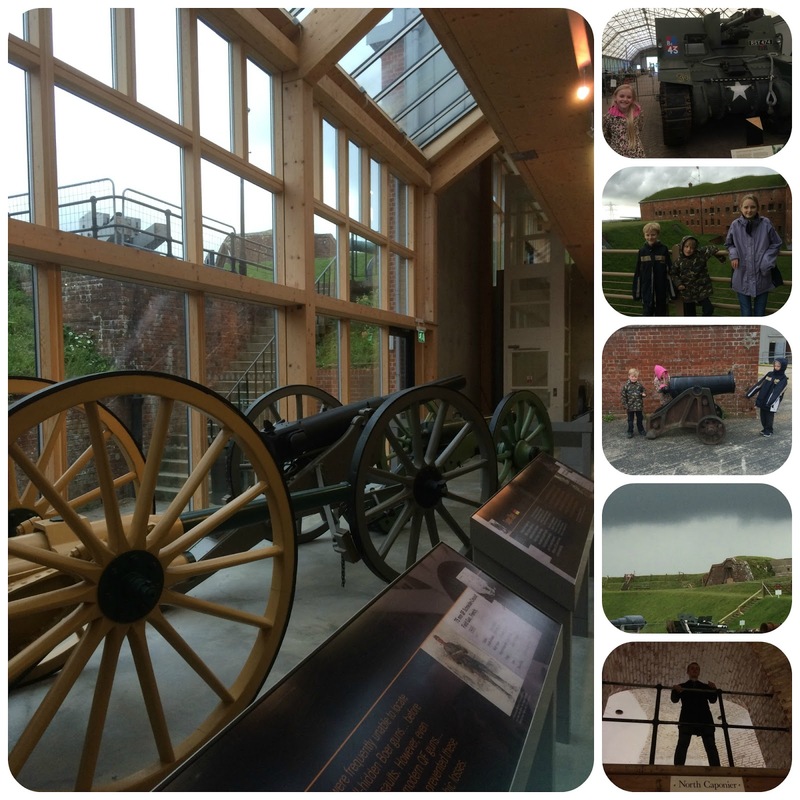 The next day the rain clouds started to move in so FDIL suggested we visit Fort Nelson - free and with indoor and outdoor exhibits, perfect for a changeable weather day. The children loved charging down the spooky underground tunnels and clambering up steps. Cannons, guns, war facts from over the centuries, interesting displays and a great cafe made it a good choice for any age group. The rain turned from drizzly to torrential so after a soaking as we dashed to watch the 1pm big gun being fired, we headed back to Southsea to Cumberland House a great little (free) natural history museum which we remembered had a butterfly house. Tummies were rumbling by this point so we decided to head back to the pub we'd been to the night before. With the £1 children's food offer and a fabulous lunch deal we managed to keep the bill for 7 to £26! That's cheaper than a fast food burger chain for us! The rain finally stopped and the children were keen to check out the beach area again after finding a couple of tiny crabs the day before. Sure enough a slightly bigger crab (promptly named Mr Crab) was found and duly photographed. Back to the flat for a cuppa and tea and then home for a late bedtime - but not before we disposed of Mr Crab who'd been smuggled into the car and was making it smell, well like a dead crab. Which believe me is not a nice smell. Don't expect any Ikea candles in that scent any time soon. 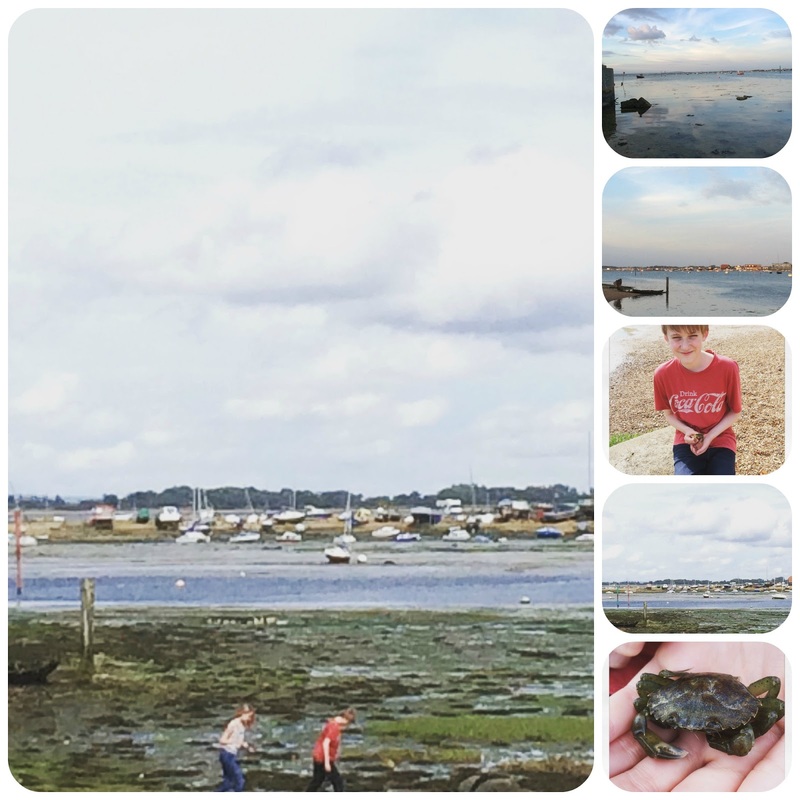 There were lots more things we could have done in Portsmouth and just a short drive away is Hayling Island and the New Forest for even more family fun. We can't wait to go again but hope we have slightly better weather next time! What a lovely family adventure from going to check on your eldest, I know just what you mean about wanting to see where they are. I know I will be the same next year when my eldest moves out to go to Uni. What a bargain you found for eating too, beats a burger fast food meal for us too, they are really pricy now when you have a few to feed. I hope you manage to return again and see some more of the area. Thank you for sharing with me on Country Kids. I'm sure we will go back often! It's a nice place to visit and easy to get to from Hertfordshire at least. I think Portsmouth is a great place to visit. My brother lives there and there are loads of things to do.